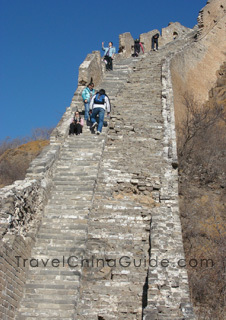 Be aware of your own limitations - acrophobia, heart diseases, and diabetes do not fit for the Great Wall Hiking. Take your health case history with you in case of any emergency. Health and accident insurance is necessary before taking any hiking tour and take the insurance and contact information with you. Make sure you wear sensible footwear. Take a pair of glove with you since sometimes you need your hands to help you climb up. It is important to have a big breakfast on your hiking day, and take enough water with you. It is very hot to hike under the sun, and sunglasses and some other protection measures are necessary. If you plan to hike more than one day, you may consider to take some first -aid medicines with you, such as medication against diarrhea, oral re-hydration powder or tablets, or some others you think are necessary according to the weather, the season and your own physical condition. If your journey involves long-distance driving, you may consider to take a CD player to enjoy and relax on the way. If you think it will be safe to leave it on the car when you are getting off, just do it. Otherwise, take all of your belongings with you, but make sure they will not be your burden. Never run or walk fast when you are hiking on the Great Wall since many parts of the Wall are broken and loose. They are not only difficult and strenuous to hike but also very dangerous. Take your full attention on this. Keep a safe distance from the person in front of you when you are walking up to avoid been hit by falling stones or bricks. Make sure to obey any warnings that are posted on the wall. At any time, never walk close to the edge of the wall since they are the first part to become loose and broken. During hiking, if you need to use a pontlevis, do not run, jump, shake, or do some other actions which may cause danger. Remember that never lean against the wall to rest before you make sure it is really firm and safe. Protect the Wall! Leave nothing except your footprints, take nothing except photographs and garbage, and maintain the plain charm of the wall. Rain storms are quite common when you are hiking in summer. Take your raincoat and be sure your mobile phone is power-off if thunderstorms happen. Stay with the team all the time, and do not wander off by yourself to make sure you will not get lost or helpless. While hiking, you may come across many local people selling the bottled waters or maps, or some souvenirs. They are all local peasants near the Wall. The bottled water is always charged CNY4.00 or CNY5.00 per bottle. We suggest you carry some on your own. If you do not want to be followed all of way by the vendors, you need to say "NO" firmly, and do not give them any promise that you will buy something when you come back. Do you recommend getting a tour guide for the Great Wall of China? From my personal experience, it would be better to visit the great wall with a local guide, because the guide's explanation will give you a better understanding of the cultural and historical background of the Great Wall and even China. Hi, I would like to know the best route for the above hike and how long does it take. Do we need a guide for this section? According to my experience, the best route is Jinshanling Great Wall to Gubeikou Great Wall, and the hiking route is around 16 km (10 miles). 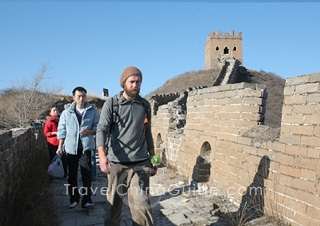 It takes around 3 hours to climb Jinshanling Great Wall and 5 hours to climb Gubeikou Great Wall. As a result, you may need at least two full days for this trek route. From Beijing downtown to Jinshanling, you can take the Tourist Bus No.980 at Dongzhimen Bus Station. The bus departs at 8:00 am and the fare for a single trip is CNY 32. It takes about 2 hours to Jinshanling Great Wall. As Jinshanling and Gubeikou sections of the Great Wall are wild Great Wall which have not been developed officially, it is better for you to book a tour through a travel agency, or you can also charter a car in advance. Do you mean that you would like to hike on the Great Wall? I recommend you hike one of the sections, like Mutianyu, Jinshanling, Simatai, Juyongguan or Huanghuacheng. These sections have been developed into scenic spots but are less crowded. You are not suggested to go to some remote areas that have not been developed yet. It is quite dangerous. You may do a one or two days hike and stay at a guest house near the site. 7 or 8 days are too much. You can spend one whole day in one of the sections of the great wall and visit 4 sections at most, like Badaling, Mutianyu, Jinshanling and Simatai. In this case, 4 days are enough. However, the sections of great wall are somewhat with the similar structure. The big difference lies in the surrounding scenery. Hello, I'm thinking about hiking the wall from Qinhuangdao to Beijing. I was thinking about taking 30 days. Is this possible? Which sections should I include on this hike? 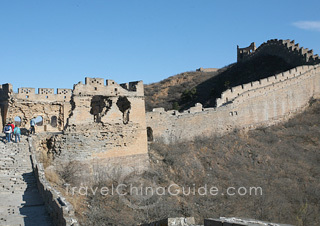 You can not hike along the Great Wall from Qinhuangdao to Beijing as the walls are not connected. From Qinhuangdao to Beijing, you may walk along the National Highway 102. There are many famous sections in Qinhuangdao, like Old Dragon's Head, Jiaoshan, Shanhaiguan Pass, Jiumenkou and the Great Wall in Zhangjiakou City. The main sections in Beijing are Badaling, Juyongguan Pass, Huanghuacheng, Mutianyu, Jiankou, Gubeikou, Jinshanling and Simatai.